Everyone is afraid of something ... for Dr. Ross Jennings (Jeff Daniels), his phobia is downright embarrassing. But when he moves his family to a small town, the one thing that bugs him most is now harming the townspeople at an alarming rate. For this unlikely hero, overcoming a childhood fear of spiders might just save the community, but it may already be too late! Directed by Frank Marshall and also starring John Goodman, this critically acclaimed breathtaking hit entertains with its terrific mix of thrills, chills, and laughter! As a producer, Frank Marshall worked on massive hits such as Raiders of the Lost Ark, Back to the Future and Who Framed Roger Rabbit. As a director, however, things haven’t gone so well. With his pedigree, Marshall got the reins to direct three fairly big-budget “tent pole”-style films between 1990 and 1995. All three disappointed at the box office and failed to reach “hit” status. None of them genuinely bombed, though 1993’s Alive made little financial impact. Nonetheless, all three seemed poised for bigger success than they achieved. 1995’s Congo was the most notable disappointment. It got massive promotion and a prime June release date but only brought in a mediocre $75 million. Again, that wasn’t bad, but it definitely didn’t live up to expectations. 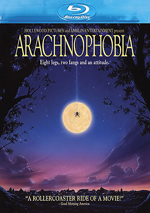 Although no one went into 1990’s Arachnophobia with the same elevated expectations that greeted Congo, it still had high hopes attached and ended up as a bit of a disappointment. I remember liking it a lot, however, so I decided to give it another look after many years. At the start, we go to Venezuela where Dr. James Atherton (Julian Sands) leads an expedition to a remote location to examine the insect wildlife. They discover various forms of never-seen species – including giant, aggressive spiders. One of these creatures bites photographer Jerry Manley (Mark L. Taylor). This doesn’t end well for the shutterbug, as he dies within seconds of the wound. Manley hails from small town Canaima, California, and his coffin heads there for his burial. The spider finds his way into the box and hitches a ride back to the US, where it escapes at the funeral home. A bird grabs it but drops it when the spider chomps/kills it. This leaves the creature near the barn owned by Dr. Ross Jennings (Jeff Daniels) and his wife Molly (Harley Jane Kozak). They just moved to Canaima to get away from the big city; Jennings plans to take over as the local doctor from retiring physician Sam Metcalf (Henry Jones). Two problems emerge. First, Metcalf reneges on his promise and decides not to retire, a choice that leaves Ross bereft of clients – and income. Second, the Venezuelan spider takes up residence in the Jennings’ barn and starts to dominate the local ecosystem when it reproduces. Bites, deaths and mayhem ensue. To a degree, I suspect that the impact Arachnophobia has on a viewer will relate to that person’s feelings about spiders. If they don’t faze you, the film will probably pack much less punch than if they give you the willies. I’m firmly in the latter camp, so that affects the film’s impact on me. It takes little related to spiders to creep me out, so the antics of Arachnophobia more than do the trick. I get a nearly constant state of the heebie-jeebies whenever I watch this ick-fest. Leaving my personal feelings toward spiders out of it, I still think Arachnophobia provides a pretty good little comedy/horror flick. At times it can seem somewhat slow, but I think its pacing works overall. Marshall builds the arachnid threat gradually and creeps toward a pretty wild finale. A more manic sense of pacing probably would’ve defanged that finish, so even though the mild meandering frustrates at times, it pays off well in the end. Although it does take a while to get to the action, Marshall builds the tension in a satisfying manner, and he uses the time to let us become acquainted with the characters. Though most of them remain little more than archetypes, this element still adds some warmth and depth to the proceedings; at least it means the spider victims are usually people we know and not just anonymous fang fodder. Daniels helps ground the piece as the lead. He offers the right mix of comedy and drama and he turns into a believable sort of action hero when necessary. The other actors give the movie oomph as well, though Kozak seems somewhat lost in the shuffle; she just doesn’t have much to do as the doctor’s wife. Honestly, if I want to find a reason to complain about Arachnophobia, all I can do is say that while I enjoy it, I always feel like something’s missing. 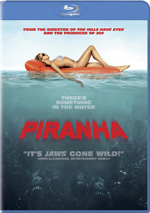 This is the kind of film that delivers a solid “B” or “B+” experience but that could’ve been an “A” in someone else’s hands – someone like Marshall mentor/Arachnophobia executive producer Steven Spielberg. Much of the time, this feels like a Spielberg film. It seems like the kind of light action flick he’d attempt, and its concentration on family life fits his MO in this era. You get the impression Spielberg liked the script but didn’t have the time to do it himself so he tossed the project to his old pal Marshall. And that’s fine – again, I like the result. I simply can’t help but think that Arachnophobia lacks a certain something. Still, it’s a fun creepfest that fires on most cylinders. Arachnophobia appears in an aspect ratio of approximately 1.85:1 on this Blu-Ray Disc. This was a good but unexceptional presentation. I admit that I suspect the image’s drawbacks largely stem from the original photography, though, as Arachnophobia suffered from some of the murkiness not atypical of the era’s movies. This mostly affected sharpness, which could be dodgy. At best, the movie displayed good definition, but it never showed delineation that I’d call impressive, and it could seem a bit soft at times. Overall clarity was fine, though; that side of things just didn’t stand out as strong. No issues with jagged edges or moiré effects appeared, and I noticed no edge haloes. I didn’t get the sense digital noise reduction affected the presentation, as it displayed a light but natural sense of grain. Source flaws were a non-factor in this clean image. Colors took on a homey, rural feel, with a somewhat sepia take on things. This left the palette as low-key but satisfying, with warm, rustic hues on display. Blacks were acceptably rich, and shadows showed fairly good delineation; some low-light shots seemed a bit dense, but they were still fine. I may not have been dazzled with the image, but I still thought it held up well and earned a “B”. As for the film’s DTS-HD MA 5.1 soundtrack, it also has endured the last 22 years nicely. The soundscape proved to be fairly active and involving. From the opening in Venezuela to the climactic spider assault, the movie used the spectrum in a satisfying manner. The front channels demonstrated the best movement/integration, but the surrounds got a lot of work as well. Though the track lacked convincing split-speaker usage in the rear, those channels nonetheless brought a nice sense of place, and they bolstered the music as well. The quality of the track seemed fine. Speech occasionally became a bit edgy, but the lines were always intelligible and usually appeared reasonably natural. Music was peppy and bold, while effects came across as clear and distinctive. I felt we got a solid “B” soundtrack that leaned toward “B+” territory at times. 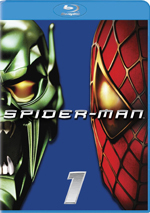 All of the disc’s extras fall under the umbrella of “Original Promotional Features”. A Production Featurette lasts two minutes, 48 seconds and includes comments from UCLA psychologist Neil Malamuth and director Frank Marshall. We get some thoughts about the movie’s tone as well as the reasons we respond to this kind of flick. The psychological interpretation offers an unusual bent, but this show is too brief to do much more than advertise the film. Within the three-minute, 10-second Frank Marshall Featurette, we hear from Marshall and actors John Goodman and Jeff Daniels. They chat about the movie’s tone and its use of spiders. Like the prior piece, it’s meatier than expected, but it’s still short and superficial. Finally, we get a featurette called Venezuela Sequence. It goes for one minute, 29 seconds and offers info from Marshall and actor Julian Sands. We find quick notes about shooting in South America. Though the shortest of the bunch, this is the most informative of the programs; it’s too bad it doesn’t run a little longer. The disc opens with ads for Frankenweenie and Who Framed Roger Rabbit. These also appear under Sneak Peeks along with promos for The Avengers, Who Framed Roger Rabbit, Castle and more ABC TV series. We get the trailer for Arachnophobia as well. Arachnophobia gave me the willies 22 years ago and continues to do so today. Although it comes with a bit of a “Spielberg wannabe” feel, it’s still a pretty funny and exciting comedy adventure. The Blu-ray delivers generally satisfying picture and audio but includes only minor supplements. Although I’d like additional bonus materials, this nonetheless becomes a positive release.